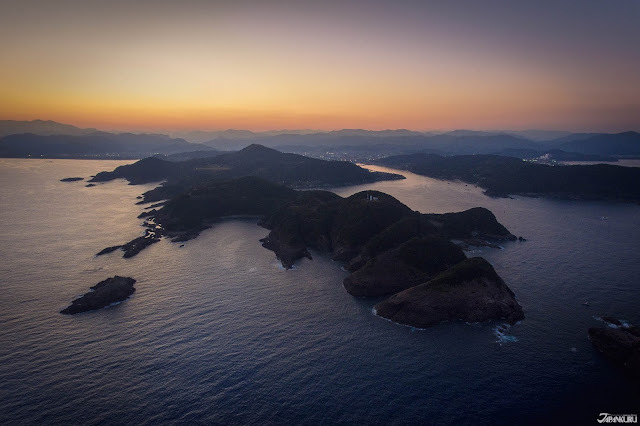 Kyushu is Japan's third largest island and is primarily known for its beautiful wide open nature and hot springs due to the many active volcanos throughout Kyushu. 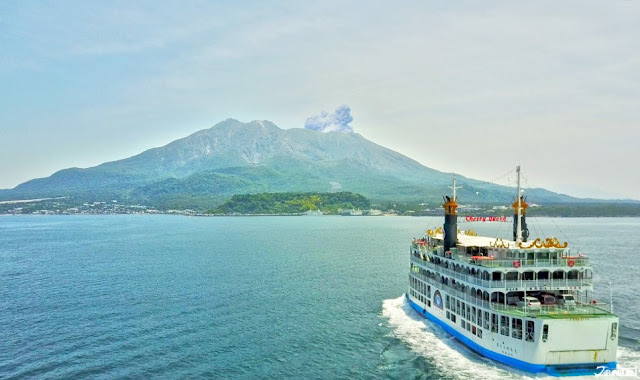 Aso Mountain, which has a caldera of world scale, and Sakurajima, which is currently active, are among the most famous. They not only provide tourist spots formed by hot springs and its smoke, but their magnificent appearance is recognized as its own value. Kyushu consists of 7 prefectures; Fukuoka, Saga, Nagasaki, Oita, Kumamoto, Miyazaki, and Kagoshima. 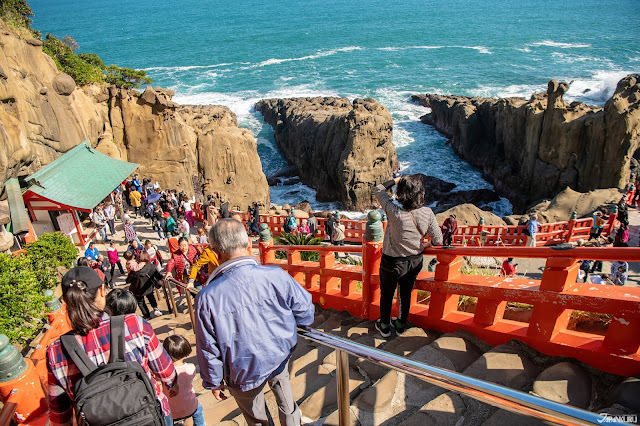 Many Westerners know about Nagasaki and Oita (Beppu), but this time we went around prefectures that not many people seem to visit. 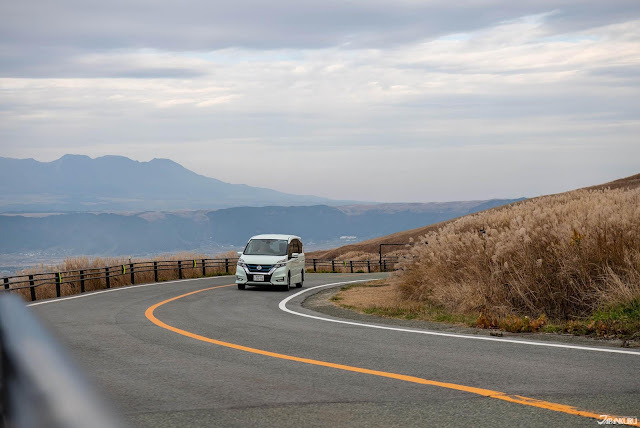 JAPANKURU made a southern Kyushu road trip, visiting Kagoshima, Miyazaki, and Kumamoto. It was in a beautiful time during fall, making some of the best pictures. 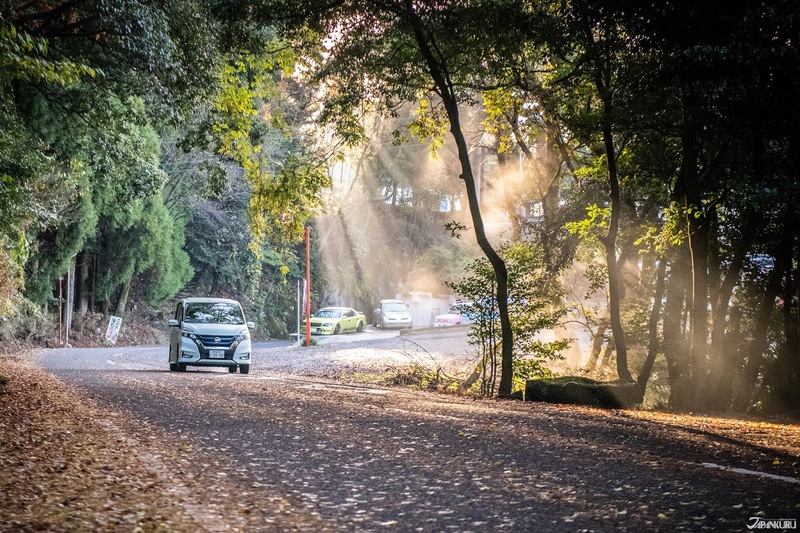 Japan is a very lovely and convenient place, but some areas are just better to explore by renting a car. Southern Kyushu is one of them. Public transportation is not as developed as the city center so you may be restricted which can be a waste cuz there are so many things to see. That reason, and the fact that road trips are just fun, is why we decided to rent a car and drive around Kyushu. There are a variety of rental car companies in Japan, but the choice for this southern Kyushu region trip is Nissan Rent-a-Car. 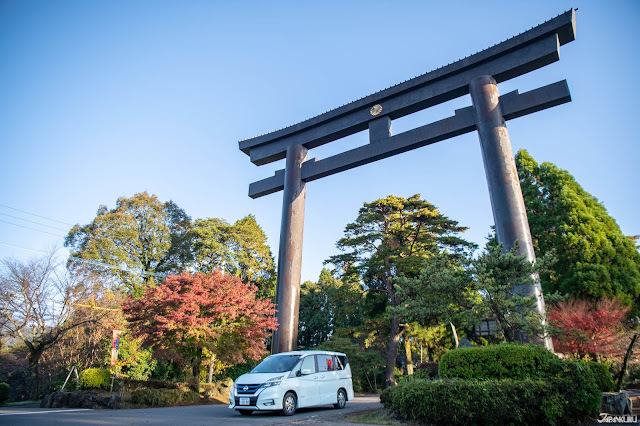 What we like about Nissan Rent-a-Car is they renew their vehicles regularly, offering safety and reliability during your trip. 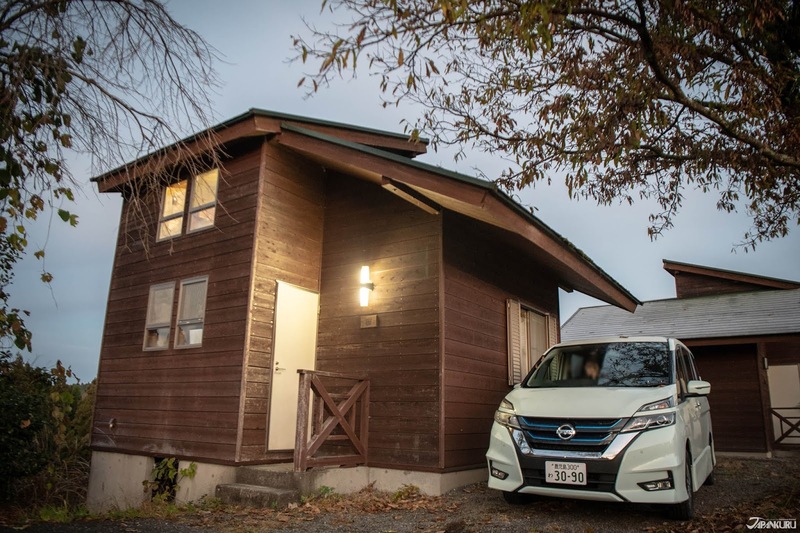 Plus the company has really worked on making it easier for foreigners to rent a car. 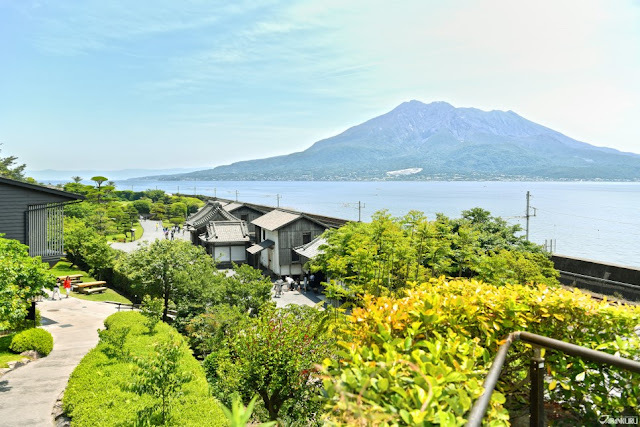 Kagoshima Prefecture is a well-known area often called "the Naples of Japan". This is due to its bayside location and towering stratovolcano Mt. 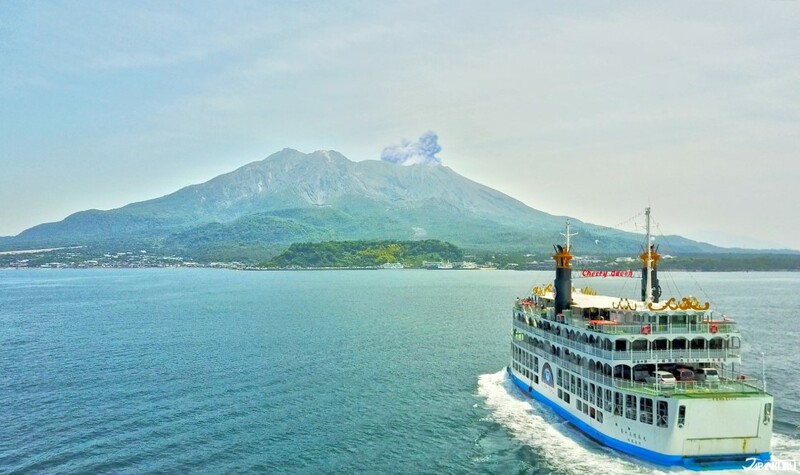 Sakurajima. In fact, in 1960, I concluded a sister city agreement with Napoli, and I think it must be one of the best port cities in Japan. 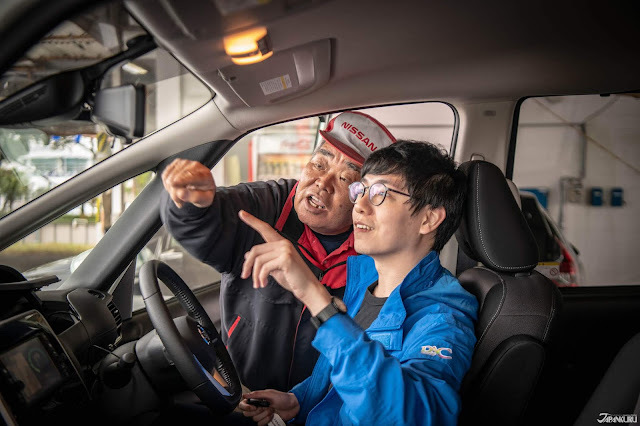 You will need an international driver's license! 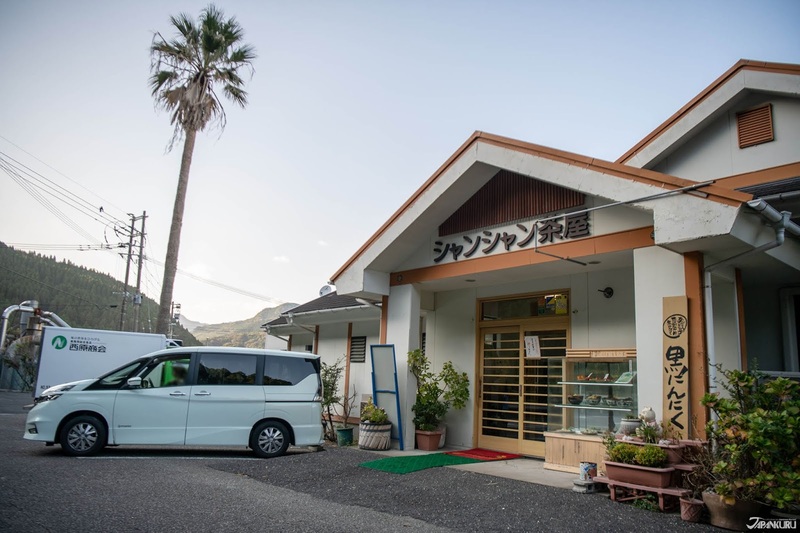 Ibusuki Onsen is a coastal area located about an hour from downtown. 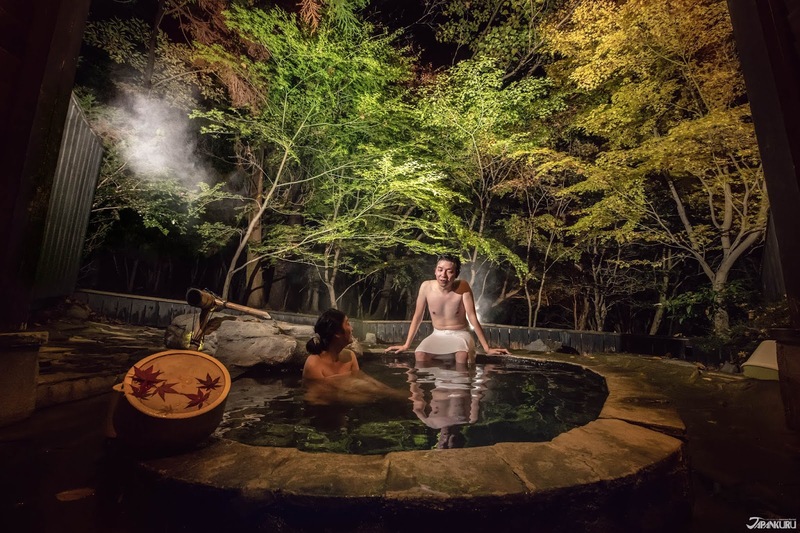 The hot springs here refer not to immersing yourself in a normal hot spring bath but in warm sand bathing, so the name of the hot spring is also called "sand bath" or "sunaburo" (砂風呂). The sand here is not the same as that you would find at a regular beach. 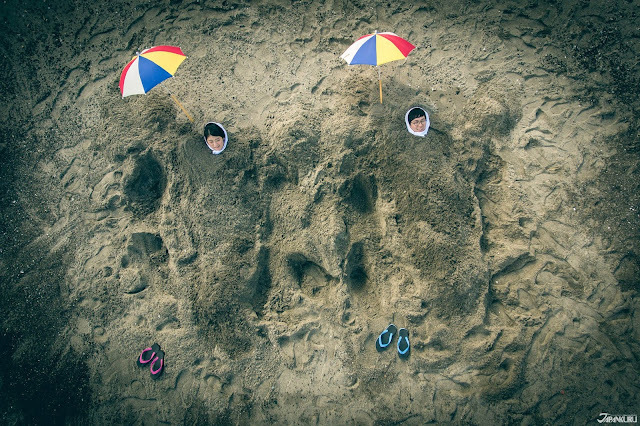 The sand here has a temperature as high as 176℉ (80℃). The reason for the high temperature sand is that it has a unique terrain that flows from the land to the seashore. "Kakigori" is a type of shaved ice served as a dessert here in Japan. The shaved ice is topped/mixed with condensed milk, small colorful mochi, fruits, and sweet bean paste (usually Azuki red bean). As for fruits, mandarin orange, cherry, pineapple, etc. 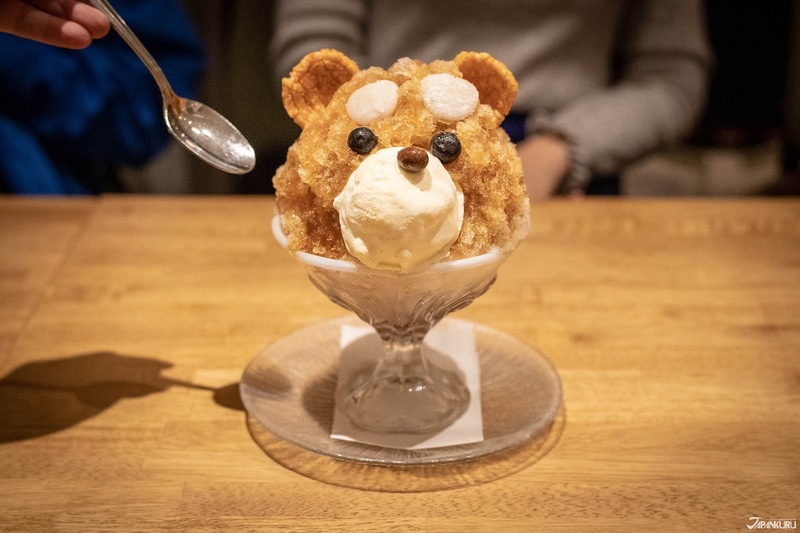 If you went to Kagoshima, you should taste this cute visual shaved ice shop "Shirokuma". It started in 1947, and then it was topped with only condensed milk and a few simple decorations. Which is said to resemble a polar bear and explains how it got its name! Now if you go to the cafe you will see their traditional and newly updated shaved ice desserts. Kirishima Jingu is a Japanese ancient shrine built in the 6th century. The shrine also plays a big part in Japanese mythology. It is said that the god Ninigi no Mikoto, the grandson of the sun goddess Amaterasu, descended from the sky to here in order to rule Japan. Thus now it is also registered as an important cultural property of Japan. 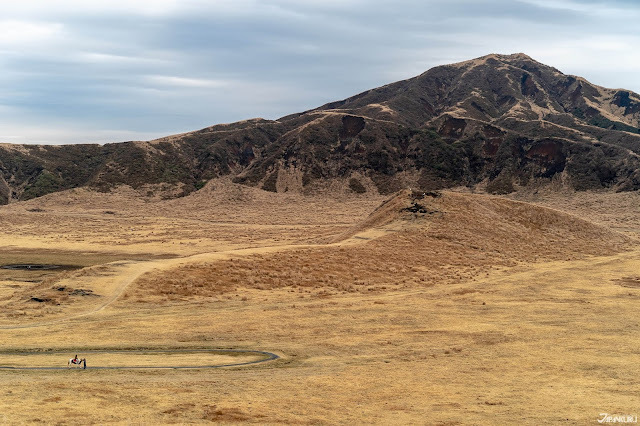 Originally it was located deep in the mountains, but it was reconstructed several times due to a volcano eruption, and eventually, it was completely moved to its current location in 1715. CNN voted Sengan-en as one of the world's best/most beautiful areas IN THE WORLD! Originally it was built in 1658, now it is open to the public and it was registered as a World Heritage Site in July 2015. 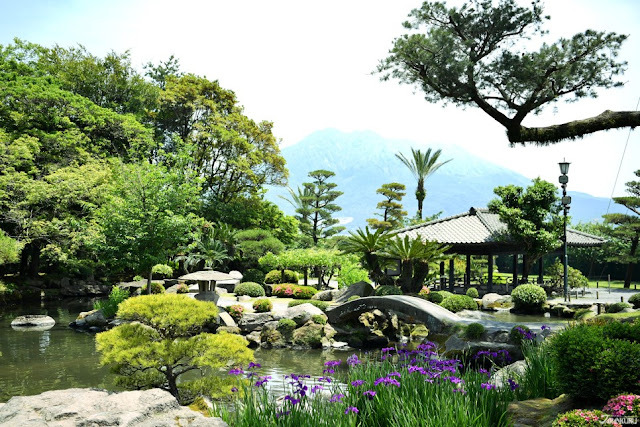 Being on Kagoshima's Sakurajima Island, Sengan-en gives you a beautiful side into Japanese culture with its traditional Japanese garden. Adding a trip to a hot spring was a must for us during our trip around Kagoshima. In 1819, hot springs were found in this area, then the hot spring we visited Ryokojin-sanso, a mountain lodge opened in 1917. What threw us off was this hot spring water can be drunk and is said have gastrointestinal health benefits. we recommend staying at the Best Western Rembrandt Hotel Kagoshima Resort. Taking a different image, Miyazaki Prefecture is known for its beaches and waters. 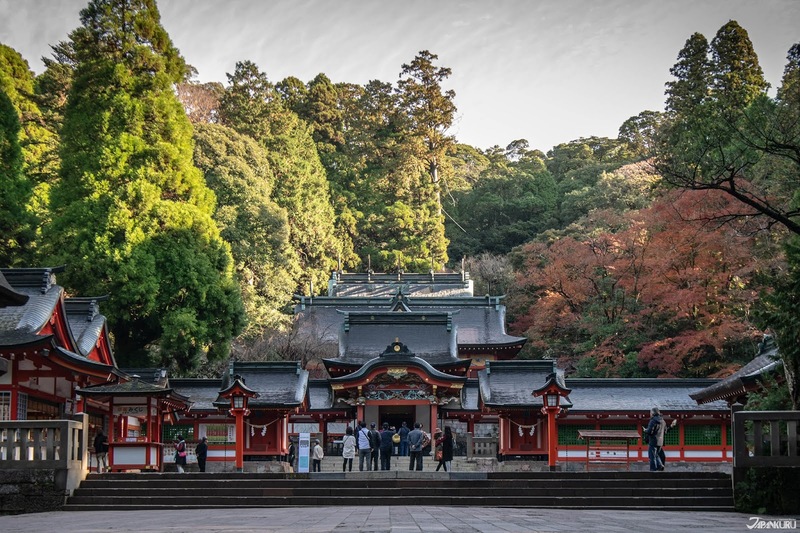 Udo-jingu is known as the representative temple of Miyazaki Prefecture. It is believed to be mythical birthplace of the first Emperor of Japan, Emperor Jimmu (神武天皇). 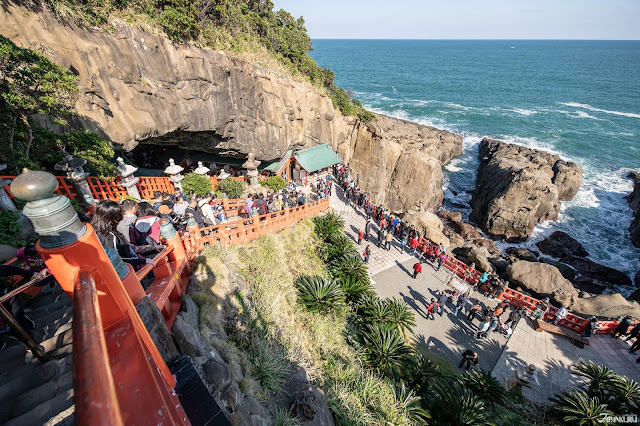 The shrine is painted with beautiful bright colors alongside a giant cliff overlooking the ocean. 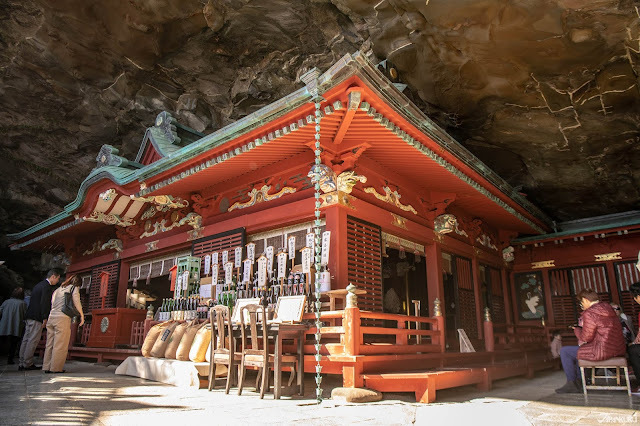 What is very unique is that the shrine is built in a cave under the sea cliffs. 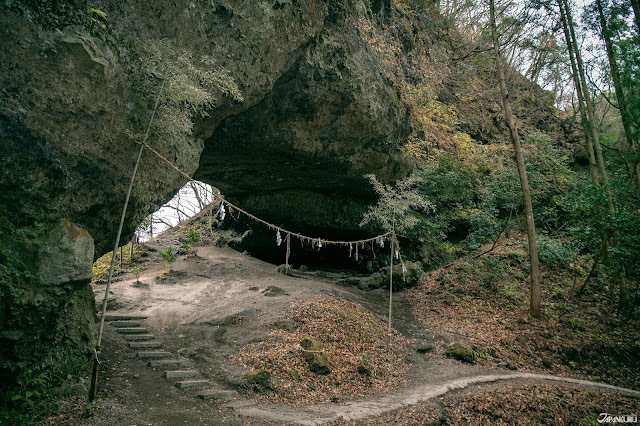 According to legend, the goddess of the waves cut down the cliffs to make caves here, which brought them to decided to build the shrine here. It is also believed that drinking the water that drips from these rocks will be beneficial for pregnancy, childbirth, nursing, and women hoping to have a child. Udo-jingu is a very unique Japanese shrine that has become a new favorite of ours. Sun Messe Nichinan is a place where you can see seven moai statues built on the coastal hill. The Sun Messe statues here the only replicas allowed to be made of the originals in the entire world. But why here though? 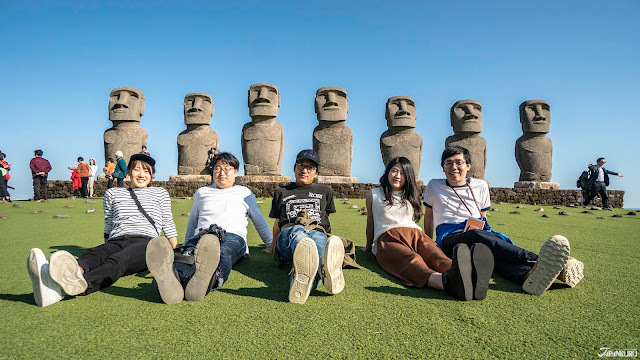 When the Moai statue of the eastern island in Chile became difficult to preserve due to natural disasters and civil wars, a research and restoration team was formed in 1990 to contribute to world peace in Japan. In recognition of his efforts to restore the Moai statue for about three years in cooperation with the locals, Miyazaki was allowed to have the only Moai statue to be completely restored in the world. 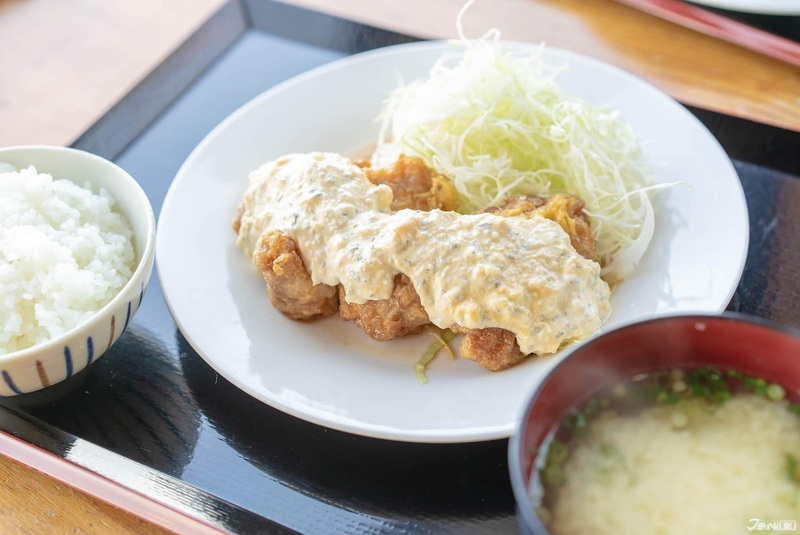 Chicken nanban (チキン南蛮) is basically fried chicken breast dipped in a soy sauce and vinegar sauce covered in tartar sauce, and when you travel to Miyazaki, it is one of THE most recommended foods. It is, of course, a very common food in Japan, but you haven't lived until you've tried the chicken nanban from Miyazaki. 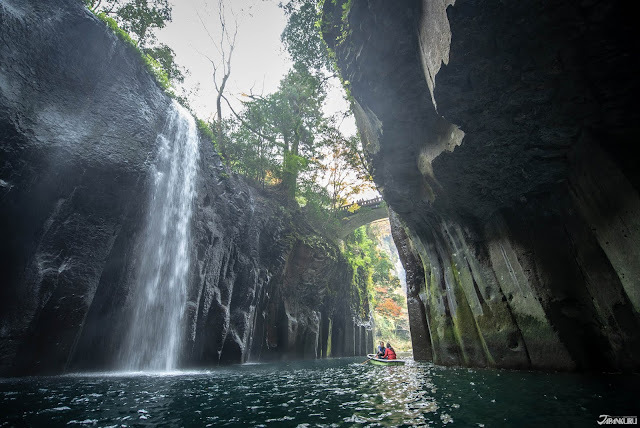 Takachiho Gorge (高千穂峡) is one of Miyazaki's most beautiful scenic spots. 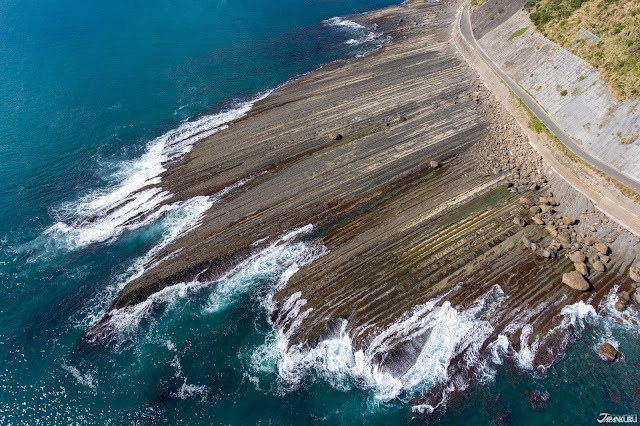 The V-shaped gorge was formed from lava from Mount Aso which over time eroded to create 80～100m high volcanic basalt cliffs which are said to resemble dragon scales. Along the river, you will run into waterfalls which can be viewed both from above (the cliffs) and below (while rowing down the river). You can rent a boat along the southern end of the gorge which is highly recommended! A 10-minute walk along the Iwato River from the Amanoiwato West Shrine is the large cavern where, according to legend, the pantheon of all the gods and goddesses conferred on how to get the sun goddess Amaterasu to come out of the rock cave and end the darkness of the world. 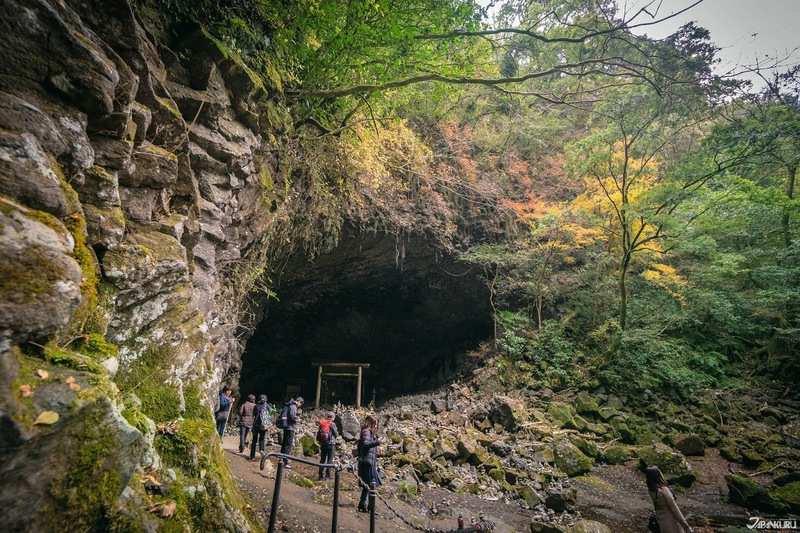 The cavern is also called the Gyobogaiwa. Originally there was only a shrine structure on the riverbank, but over the years many visiting pilgrims carried stones to the site and arranged them in piles The immense array of stone piles now standing on the Amayasu riverbank adds a mystical and fantastic aura to the site. The 70 m-high precipitous cliff that has cracked into hexagonal columns offers a magnificent view. The unobstructed panoramic view of the Pacific Ocean at the tip of the cape reminds you that the earth is spherical. There is a free observatory and a parking lot. If it gets dark, you can not see anything, so please go before the sun goes down. The place where we stayed at in Miyazaki Prefecture was Gokase no Sato Camp. The reason we chose this place, which is also a campsite and hostel, is that 20mins by car from here is a stunning view of the sea. Kamishikimi Kumanoimasu Shrine is a name that is difficult to memorize at once. It is a sightseeing spot that has been attracting attention from people all over the globe recently in Kumamoto. 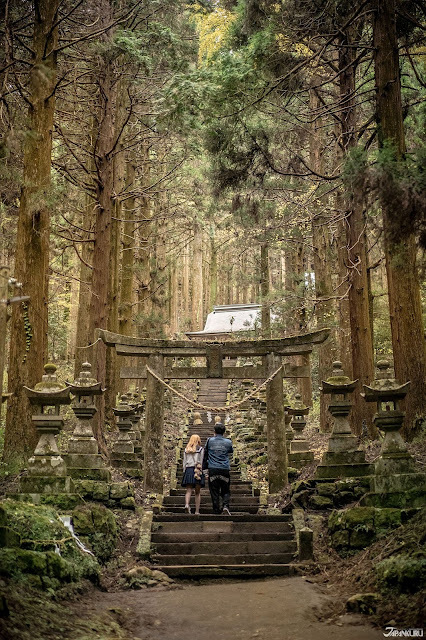 Approximately 100 stone lanterns and moss on both sides of the steep mountain trail leads to a very dreamy and mysterious atmosphere, which is also used in the animation "Firefly Forest". 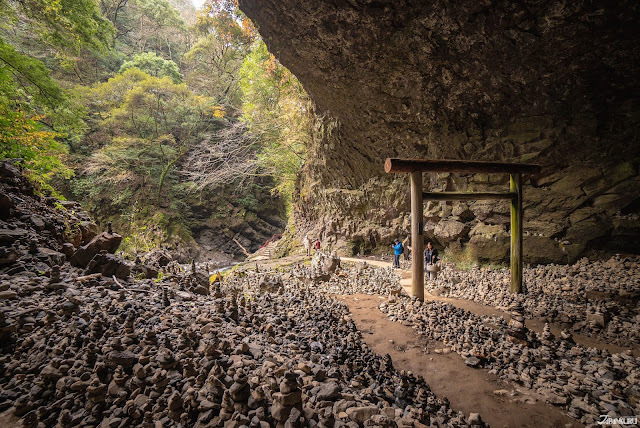 Beyond the shrine, you can see these giant rocks in the middle called "Ugetoiwa" (穿戸岩) at the top of the mountain. It is said that it is a place to pray for acceptance and victory by achieving the most difficult goal. Takamori Dengakuho Zonkai (高森田楽保存会) is a restaurant thats whole purpose is preserving the local cuisine of Kumamoto Prefecture. In traditional Japanese houses, there is a sunken fireplace called an "irori" (囲炉裏) in the center of the house. The menu that had here was Japanese miso soup, made with red miso (compared to white miso or a combo of the two) and with local ingredients inside the soup like mountain fish, taro (里芋), tofu, and konjac. This restaurant is a place where you can sit down and taste legitimate authentic Kumamoto food which makes it worth the stop. Aso Mountain is an active volcano located in Kumamoto Prefecture. 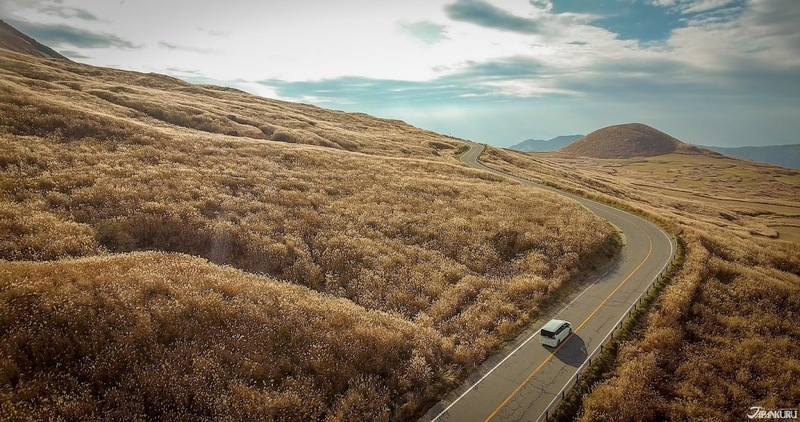 It has a volcanic activity to 1,592m above sea level, and as a caldera volcano belonging to a huge axis around the world, it is the symbol of Kumamoto who gave it the nickname of "the roof of Kyushu". 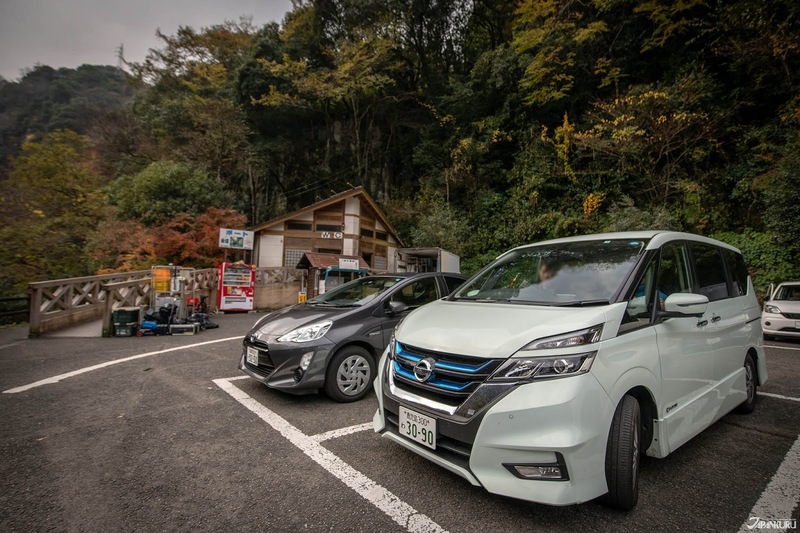 Tourists can take the ropeway around Mt. Aso and ride the plains created by the magma below the mountain, but you are (obviously) denied access when there is a high risk of volcanic eruptions. 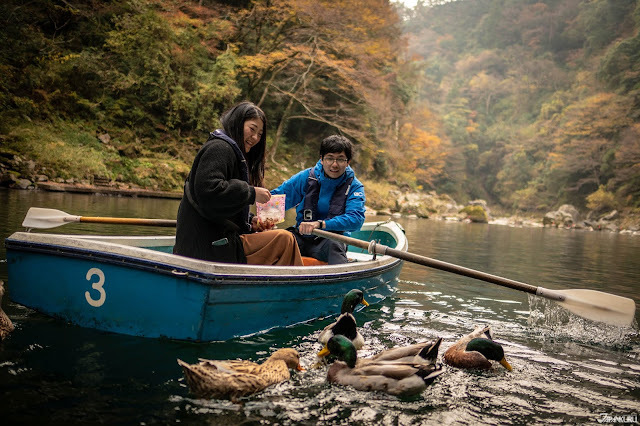 Check out our short video of our trip to southern Kyushu!